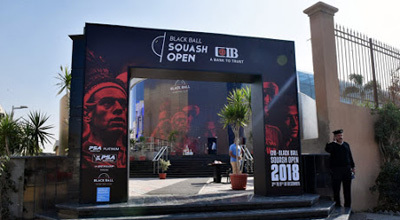 The 2018 CIB Black Ball Squash Open enters day four of the competition, with Round 3 matches currently being played at the courts of the Black Ball Club in New Cairo amid a high spectator turn-out. The one-week event, which runs from 3 to 9 December, is witnessing the participation of 48 players representing countries including England, Germany, France, Switzerland, Scotland, Spain, Colombia, New Zealand, India, Pakistan, Peru, Australia, Hong Kong, Mexico, the US, Malaysia, Wales and Egypt. They are competing for the lucrative prize of $180,000. The tournament, one of the world’s seven Platinum Championships, is now down to the last 16, with eight matches being held today to decide the quarter-finalists. Seven of the top eight seeds are still in contention, and there’s home interest in the last six of today’s matches – with Egyptians seeded to win all of them. One of the eight scheduled matches today has already ended with the tournament’s 4th seed Germany’s Simon Rosner beating France’s Gregoire Marche 3-2 ( 5-11, 9-11, 11-8, 11-5, 11-5) in 72 minutes. The second match is currently underway with the 6th seed Paul Coll of New Zealand taking on England’s Chris Simpson. 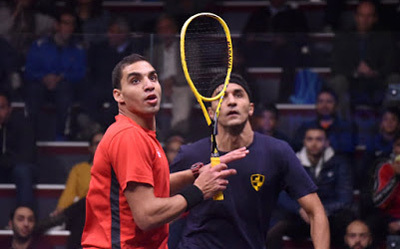 Egypt’s 8th seed Mohamed Abou El-Ghar will take on George Parker of England in the third match, while teammate Omar Mosaad is to face India’s Saurav Ghosal in the fourth match of the day. 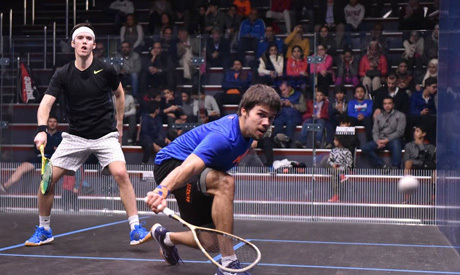 The four other matches will be played in the afternoon starting 17:00 Cairo local time, with 7th seed Karim Abdel-Gawad of Egypt playing against Peru’s Diego Elias. It will be followed by an all-Egyptian clash between the 2nd seed Ali Farag versus Mostafa Asal. Mach seven of the day will see 3rd seed Tarek Moemen of Egypt taking on Germany’s Raphael Kandra. The day will conclude with Egypt’s and the World’s top ranked player Mohamed El-Shorbagy against Eain Yow Ng of Malaysia. 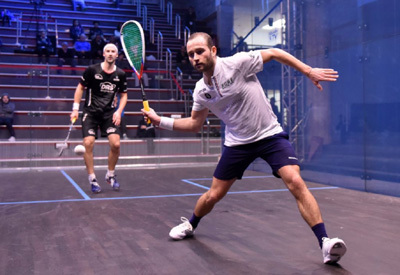 Squash lovers can follow the competition live on SquashTV/Eurosport, follow updates on live scoring on our Twitter Feed, and we will have photos on the gallery, match reports on the blog, and roundups at the end.